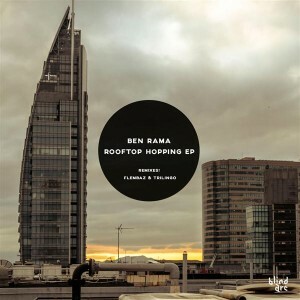 Ben Rama, an artist based in eastern Canada, returns with Rooftop Hopping, showcasing his original approach to techno music: distinctive deep bass lines and groove with a touch of psychedelic. Released on Blind Arc, a Portuguese label devoted to techno and psychedelic music, these tracks have been tested on dance floors across North America and are bound to make everyone move. Apart from two original tracks the release also contains a pair of powerful remixes by Flembaz and Trilingo. Mastered by João Bandarra & Pedro R. Artur (Flembaz) at Tripalle Studios with artwork by Fred Sarmento and original photography by A. Synaptic. MP3 Download | FLAC Download | WAV Download · Download count: 8,360. Powerful release! Very lucky to have been there the first time Ben ever played Rooftop Hopping at Eclipse 2012 (Canada) as well as the night/day of the inspiration for the track “Rooftop Hopping” – A Psytrance event in NYC on November 12, 2011 organized by the SYNC crew with Ben Rama, Grouch, Lunecell, Kabayun & more. The Original location was a legendary underground warehouse/loft spot “Lombardy” that had a rooftop deck next to I-278 in Brooklyn- That got broken up by the NYPD. No way the party could stop though, everyone hopped on over to the rooftop over on a 35 story rooftop on Dekalb Ave. A few hours later that rooftop got shut down as well. Grouch and Ben Rama never got on the decks at that point though, so guess its onto the next rooftop…a 7th floor rooftop looking at the empire state building in the middle of Manhattan – There everyone got their time as the night turned into the morning and the party went on until noon, when finally the cops came by for a 3rd time…but by that point, everyone was laughing and smiling as it was time to go home. Here are some photos of the night/day! Top quality production, overall a great drive!! love it all! I’ll play the Flembaz remix on my next set. I’ve played the original out a few times last year and the bass that comes in after the first breakdown never fails to have an impact on the floor; then the progressive effect of the melody keeps the energy building from there. These remixes really honor the original and take it to the next level; I’m really liking where these collaborations are headed guys, great to see these international connections bearing fruit. new Ben Rama with remixes by Flembaz and Trilingo? can you get a more perfect release? Stunning remix from Flembaz! Привет из России!!! every track is fantastik snack ..really enjoy listen this piece of sound art.